Born in the year 1973, Leander Paes is an Indian Tennis Star from Calcutta. He is the third Indian to win Junior Wimbledon title and second after Ramesh Krishnan to win two junior titles in Grand Slam Tournament. He won two team gold medals and one individual bronze in Hiroshima Games,1994. In 1995, he beat the twice Wimbledon finalist, Goran Ivanisevic in the Davis Cup zone match. 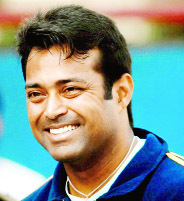 Leander Paes won bronze medal for India at Atlanta Olympics in 1996. He won six titles in men’s doubles in 1997 as also 1998 Italian Open alongwith Compatriot Mahesh Bhupathi but 1998 proved unlucky for the India duo losing Austalian and Wimbledon in men’s doubles. He is the second Indian after Vijay Amritraj to win the Hall of Fame Tennis Award. He proved a giant killer by defeating No-1 Pete Samprass in ATP Tour. Earlier, Paes enrolled with the Britania Amritraj Tennis Academy in Madras (Chennai) in 1985, where he was coached by Dave O Meera. The Academy played a key role in his early development. He shot into International fame when he won the 1990 Wimbledon Junior title and rose to No-1 in Junior World Rankings. Leander currently features in the doubles events in the ATP Tour and the Davis Cup Tournament. Write a brief description about him in 250 words. 1. Who will lead India A team against forthcoming Series against South Africa-A? 2. For which team Paras Dogra played in IPL-8? 3. Which faction of JKCA fielded the team in the first match against Punjab in Under-19 Girls BCCI Tournament? 4. Who partnered Sania Mirza in Guangzhou Open women’s doubles event? 5. Who is Amitabh Choudhary? 1. Sanju Samson 2. Delhi Daredevils 3. Ansari faction (so far) 4. 42nd 5. Congress leader and chairman IPL. The best entry of this week was received from Sanjay Dhar, Lane No 1, H No-3, Upper Laxmi Nagar, Sarwal Jammu. The other entries of the week were from Gaurav Sharma, Gandhi Nagar, Jammu; Satish Kumar, New Plots, Jammu; Ramesh Singh Jasrotia, Vijaypur, Samba; Anubhav Anand, Bakshi Nagar, Jammu and Sachin Singh, Gadigarh, Jammu.